The following is a review and giveaway provided by FlyByPromotions. Natalie Grant is an award winning singer, and my daughters and I all enjoy her music. Now she is an author, too! 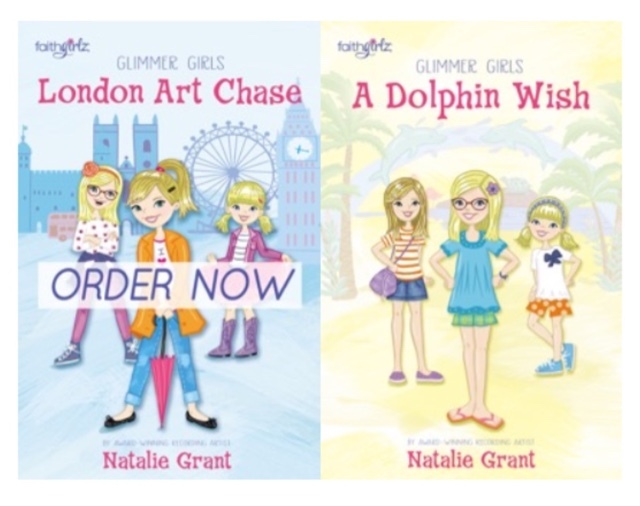 Glimmer Girls is a sweet new series for girls aged 9-12 inspired by the artist's own daughters. The first two books introduce the main characters: twins Mia and Maddie and their little sister Lulu. Book one is the London Art Chase. When the family travels to London, their adventures begin in an art gallery. Book two, A Dolphin Wish is about the girls' visit to Captain Swashbuckler's Adventure Park in San Diego. Their exciting adventures are accompanied by delightful illustrations. My daughter is an avid reader and I'd like for her to read these books. Thanks! I would love to win this for my daughter. She is really starting to love reading and great books will keep her interested. My daughter would love these. She is an avid reader! I would love to win one for my niece because she loves to read and one for my daughter so I can read to her. I would like to win one my neighbor's little girl. I have know her since she was a baby and she is just the perfect age for these now. I would love to win it for my niece! I would love to wi this for my daughter! She is the perfect age and loves to read, so I would love to surprise her with this! These reading books would be wonderful for my nieces. I would love to win for my daughter, Maddie. She would love these. She is an avid reader! I would love to have these for my daughter, she loves stories about other girls. I have always liked Natalie Grant's music as well! Thank you for the chance! I want to win these for my daughter who loves to read. I am always searching for quality books with an aspect of faith for my 9 year old daughter so I would love to surprise her with these titles. I'd love tow in this for my girls. I want to win because I think my daughters would enjoy these books. My great nieces are 7 and 9. They are being encouraged to read 20 minutes each night. They would enjoy this and it would help with their mission to read more! My daughter loves to read and would love. My daughters are the perfect ages for these books and would absolutely love to have them! I love to encourage reading and learning and a new book is the best way!